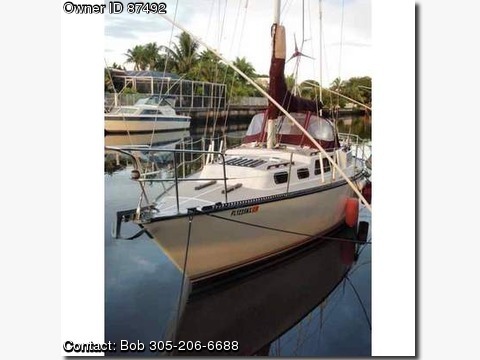 1987 S2 Yachts 9.2 center cockpit,Rare center cockpit design, perfect for coastal cruising, Bahamas or beyond, shallow 3' 11" draft, with big boat amenities and easy to sail, this is the second to last model built and includes all the top options, recent survey for insurance (April 2009), hull is in good condition, bottom painted recently with top quality anti-fouling paint, boat was completely fitted out for live aboard cruising by previous owner, unique aft double berth cabin for this length of vessel, comfortable cockpit with great all round vision from helm, good ventilation with eight ports and two hatches. Redundancy and illness causes sale. Boat is in the water and ready to go, easy to view. $29500, 3052066688 Accomodations: sleeps 5, private double aft cabin, separate forward v berth, single bunk in main cabin, private head (new) with shower, galley, navigation station, solid wood folding dining table with drink holders, beautiful teak throughout interior, teak and holly sole in main salon, new carpet in aft cabin, brass clocks, barometers ad light fixtures, screens for all hatches, fans, two nicro fico day/night plus ventilators. Mechanical Equipment: reliable Yanmar 2GM diesel 18 HP, sips fuel, Galley: two burner stainless steel gas stove with oven, Adler-Barber cold plate refrigerator, sink with hot/cold water, storage cupboards Electonics and Navigational Gear: Autohelm 4000, new Garmin GPS 545s, Standard Horizon VHF, LED lights, Raritan hot water heater, propane sniffer, Furuno radar, icom SSB and antenna, Micrologic Loran, radar reflector Electrical System: new two series 29 house and one series 25 start batteries, inverter, charger, alternator and spare, voltmeter and amp meter. Shore power connection with cable. Deck and Hull Equipment: center cockpit, all new brass thru hulls, Edson wheel steering, 6 self tailing winches, cockpit cushions, fold up table with drink holders, dodger and bimini, sail and wheel covers, 6 sails in excellent condition including streaker and trysail, 4 anchors with extra rode and chain, fenders, dock lines, man overboard buoy, fold down SS boarding ladder at transom, new outdoor propane grill, life lines, Additional Equipment: new Revere 6 man life raft, life vests, life harnesses, bosun's chair, watermaker, EPIRB, flare guns and flares, sextant, tables and charts, Pioneer CD/radio with speaker in main salon and aft cabin, water-diesel-gas cans, plus many other extras for cruising.